Guests are greeted by a 69m long ‘ship’s hull’, containing the reception. Photo: Peer Lindgreen. Sitting between the OXO Tower and Blackfriars Bridge, Sea Containers House holds an imposing presence between the iconic London landmarks on the banks of the Thames. American architect Warren Platner (1919 - 2006) designed the 16-storey Sea Containers House in the Seventies originally as a luxury hotel, but the building's brief was never fulfilled and it was occupied as offices. Among these was a shipping company, Sea Containers, from which the building drew its name. Commissioned by the American Morgans Hotel Group, Design Research Studio has now completed the building's transformation from offices into a hotel, as originally intended, using its maritime history and the Anglo- American relationship between design research Studio and Morgans Hotel group, as design inspiration. Guests are greeted by a 69m long 'ship's hull', containing the reception. Photo: Peer Lindgreen. 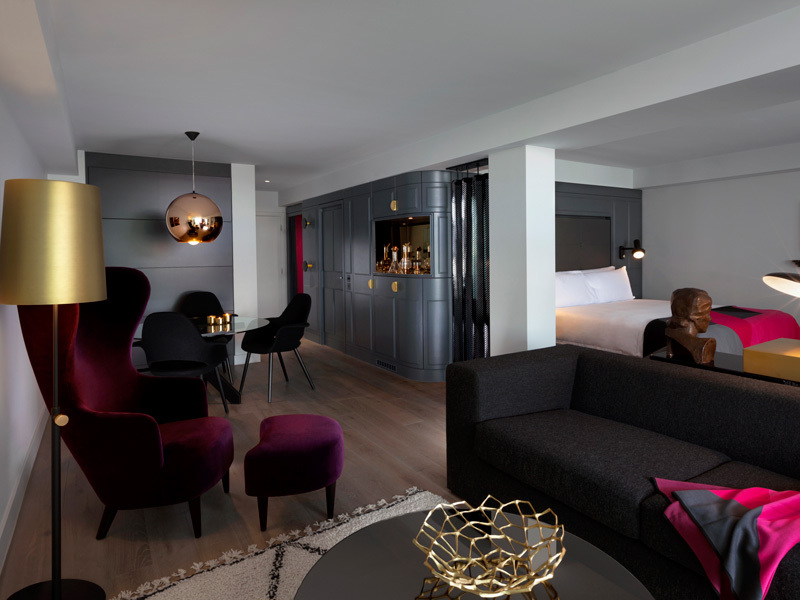 'This is the first hotel we've completed, as well as being the Morgans Hotel group's first UK hotel,' says Helen Arvanitakis, head of interior design at design research Studio. 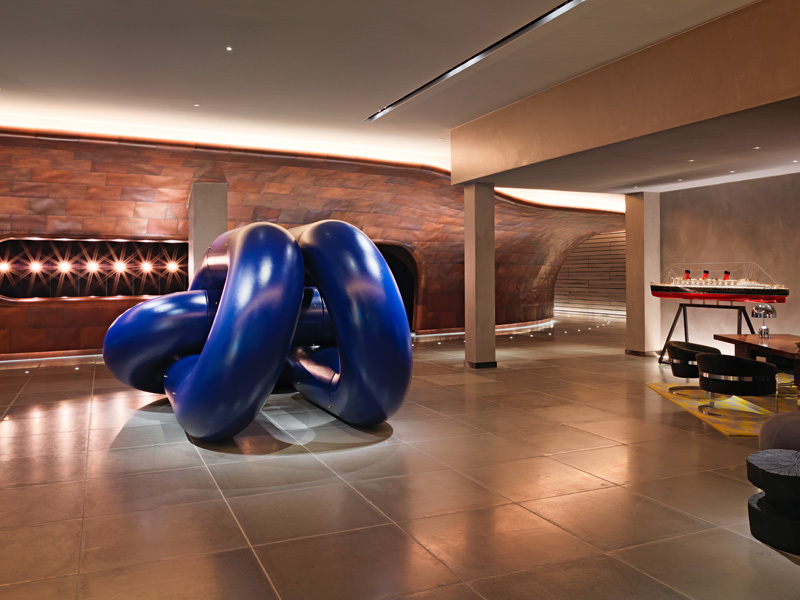 Under the creative direction of Tom dixon, the hotel design embodies the elegance of a transatlantic Twenties' liner, as well as incorporating platner's work with his furniture featured in the hotel's exclusive suites. In the main lobby of hotel, guests are greeted with an impressive 69m-long ship's 'hull'. 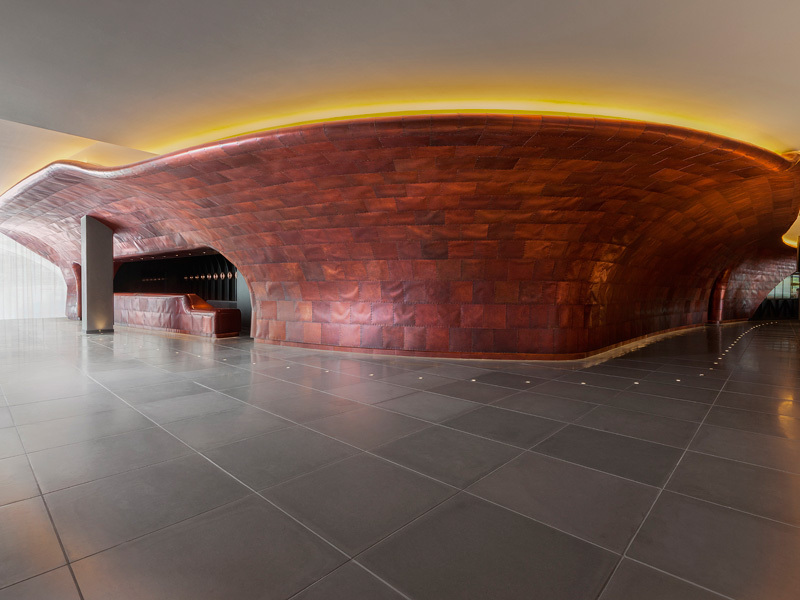 'This features authentic ship-building skills and was made by the same team who restored the Cutty Sark,' says Arvanitakis of the magnificent copper-clad wall dominating the generously sized lobby space. Sharing the space is three huge blue chain links, produced by company Six inch to literally symbolise the US/UK link. 'it is also a British engineering reference that combines a Jeff Koons' twist,' adds Arvanitakis of the American artist who is known for his reproductions of banal objects. The vast 1,500 sq m ground floor area includes one riverside restaurant and bar, which once again take visual inspiration from US/UK design. The Sea Containers Bar takes the form of an American diner, equipped with swivel stools and clustered seating reminiscent of booths. The space also features a false ceiling, which is punctured in areas to expose the coffers of the original ceiling unearthed during the transformation. 'It's a Seventies' building that should not be denied its heritage,' says Arvanitakis, with the Design Research Studio team keen to detail elements of Platner's design work throughout the scheme. 'Stripping back the coffers also creates high parts to the scheme, to help raise it visually,' she adds. Walking through to the Dandelyan cocktail bar this space takes on a more British form with Chesterfield sofas and herringbone-patterned floor. 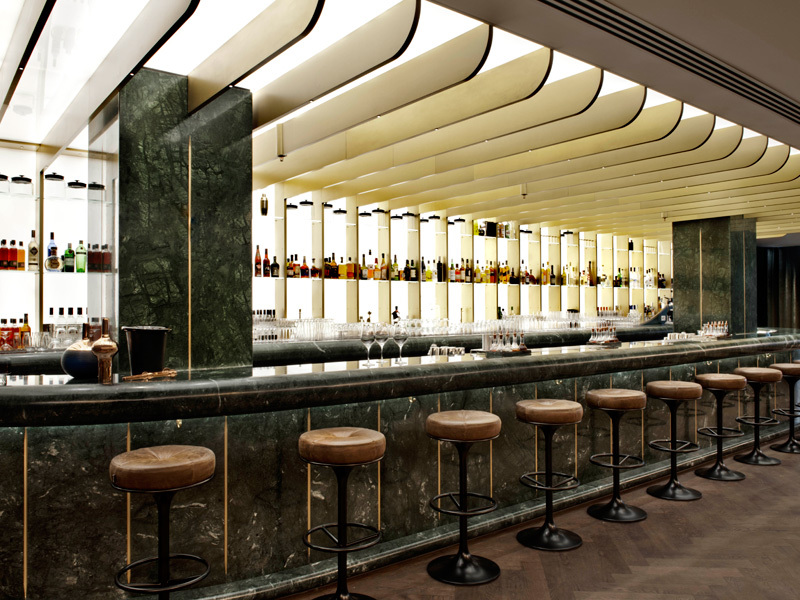 The scheme features a rich colour palette including bottle green and bronze, which Arvanitakis says takes it inspiration from a gentleman's club. The design immerses you into the golden age of travel, from the art deco-style ballroom on the 'top deck' of the building, offering panoramic city and Thames views, to the hotel's spa in the hotel basement that is below river level. Drawing from the signature colours of the Morgans Agua brand, the spa architecture graduates from white through to darker shades to encourage relaxation. 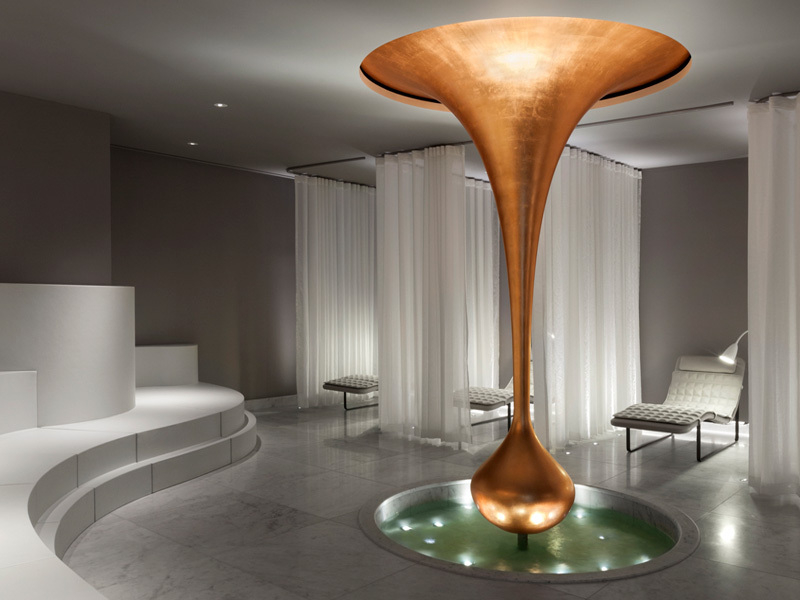 Creating a feeling of under-water tranquillity and taking its inspiration from the 'cocooning nature of a submarine', the spa has a water feature designed by Jonathan Mizzi that guests can lounge around and dip their feet in. Continuing the maritime theme is the blues' palette used in the hotel's 61-seater screening room, also located on the hotel's lower level, to be used for TV and film premieres, as well as conferencing requirements. A series of flexible breakout and meeting rooms are also available if more work and less play is on the agenda. The basement spa features a toe-dipping water feature/sculpture. The more deluxe rooms feature a balcony, which if the tide is in, really does transport you to an imaginary Atlantic crossing with the water lapping at the hull, rather than the banks of the Thames. And for more 'onboard' detailing, the public WCs in the hotel lobby draw on marine engineering, featuring porthole mirrors and detailing usually found on board a ship.